We can say with 99% confidence this winter will be better than the last… Webcam is operational, ongoing work installing a dish heater to make the cam more reliable (it tends to malfunction during large snowfalls due to snow on the dish). Road is in good condition thanks to Quarry. They appear to be going strong so expect reliable plowing. Remember to park with thought for the large haul trucks. Thanks everyone for your help with all. Be safe. Someone brought this up the other day. Now that Marble Peak is skied so much, it doesn’t seem to produce full-path avalanches. That could change if we get some kind of unusual series of storms that close the road and build up a 2+ meter snowpack. But for now, parking at Lumber Curve within the Marble Peak avy path (where the Anthracite Pass trailhead is) is a workable solution. 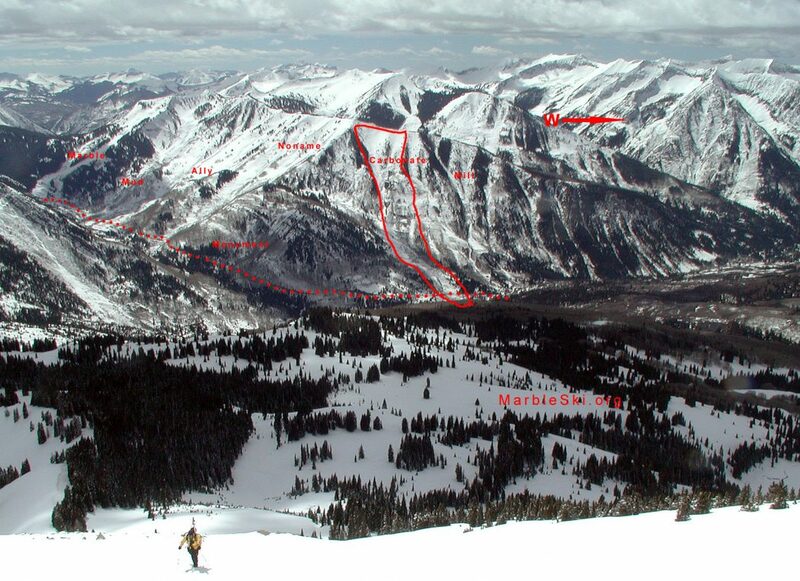 We were around the first specifically known time Marble Peak slid full path, February 1995 (reference, Colorado Avalanche Information Center 1994-1995 Annual Report). This class 5 avalanche took out a mature spruce forest above the road, extended the runout into mature aspen forest by 300 feet, and improved the skiing immensely. Quite impressive for an avalanche path that’s not really big in topographical relief, at only around 2,500 vertical feet if you count the runout. What’s interesting is not only did the big one get turned by terrain features, but it ran an impressive distance on lower angled terrain below the road. Google Earth tells the tale. This long return period avalanche (LRP) occured during a week-long storm cycle that brought the snowpack in the Yule Quarry region to more than 7 feet (84 inches) on the ground (possibly 8 feet in places), with a water equivalent of about 7.3 inches. According to comments on this post, that have jogged our memory, the Marble Peak path ran full-path again in 2005, during the same cycle that shattered a mature aspen grove on what’s known as “Pre Mud,” the slope just before Mud Gulch as you’re headed up the Yule Quarry Road. Indidentally, the huge 2005 Cleaver slide off Chair Mountain also ran at this time. What’s the takeaway? Until the snowpack gets quite deep and unskied, in our opinion parking at Lumber Curve is less risky than driving highway 133. But be aware of trends. When the snowpack gets quite deep (we’d define that as more than 6 feet, 72 inches on the ground) and unstable, the Marble Peak path could go big. At this time (January 2017) we may be approaching that situation.